Excellent post--I'm inspired to take a first level party on a giant slaying adventure. It leaves me wondering, however--have you ever actually implemented such an approach? I would worry that low-level adventurers would get confused and frustrated (and annihilated) when they are put up against against such baddies, because their expectation of a goblin massacre encounter is so ingrained. Also: the accompanying art is spectacular. I think you've done an art post or two in the past, but I would mind another one. Any artists on deviantart.com you can recommend? I don't know why more rpgs don't go with something like this outside of boss encounters. I might argue that WFRP doesn't support "goblin massacre" play at early stages of the game, simply because starting adventurers would have trouble with one goblin, let alone ten. In all fairness to 4e, there is an attempt in the game to emulate something like this, with "brute" and "solo" type monsters, which are essentially a level-appropriate bunch of monsters all in one, swapping 5HD of goblins (4e doesn't use hit dice, but you get the idea) for a single 5HD monster. It doesn't work quite as well as intended, but the intention is there. I've played a successful adventures based around "giant hunting" using the 3e, but when I switched to S&W I've found that early D&D didn't support this type of adventures well. On the other hand, I've managed to get around this by two means. I used a singe imitative roll for each side, rather than each of the combatants and I tried to present a quite common monster (an ogre to be exact) as a beast of almost mythical proportions. I like giant-slaying a LOT and have found D&D EXTREMELY well-suited to it. Basically, for low-level PCs, it forces them to strategize and think about how to use the environment to their advantage. And they do. The whole point of the early D&D combat system is, I think "You can;t win this way in a stand-up fight--so find a way to not have a stand-up fight." I quite like this style of play, and a lot of my combat scenes involve this type of play. But I'm a fan of systems where combat is deadly, rather than an accounting exercise. I somehow feel that this is primarily problem of XP distribution and accumulation. Mob rules might make it easier/more obvious how a group of low-level characters could go giant-hunting. I agree with the notion that there is a problem that relates to experience. As it stands D&D's reward system encourages the goblin massacre approach. Thwarting, wounding, scaring off, tracking down and various other actions that could conceivably lead towards the slaying of a giant do not traditionally reap experience rewards. Of course one could rule that the party could get a portion of the XP for such actions. I think the game for this stuff is Ars Magica, not necessarily mechanically, but certainly atmospherically. That's what your Arthur Rackham illo evokes - dirty old Mythic Europe with it's northernness and such. 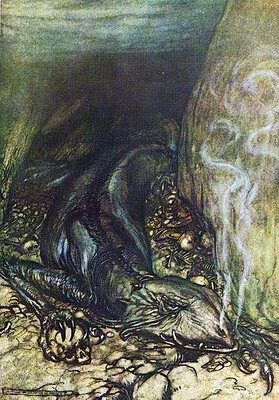 It's a pity old Rackham was temporally restricted from illustrating Tolkien. Ivan: I think you just need to make it clear from the outset what's expected, so that everyone's singing from the same hymnsheet. The artwork is by a man called Arthur Rackham - most of his stuff is now freely available, because he died in 1939. I never really visit deviantart.com, I'm afraid, so I can't recommend anyone. Kelvingreen: WFRP is about Rat Massacre. Zak: I can't help thinking that some other game somewhere which I've never played might be even better. Also, there's the problem with XP. See Tom's comment below. Zzarchov: Sounds a bit like that game Mike Mearls did before D&D 4e. Somebody will remind me of the name. faustusnotes: Now that you mention it you could be right about that - all the games of MERP I've played were mostly to do with Goblin Massacre because of the tone of the campaign, but it doesn't have to be that way of course. Norman: I couldn't access the link for some reason. Tom: I've never played Ars Magica. My personal intense distaste for one of its major authors doesn't help. Billy Billerson: Yep, golem slaying is a bit less straightforward than giant slaying. The x.p. system? no way. Leaving aside the fact that my players don;t even know what they get xp for, it's a piece of cake to rig it so that the PCs know a giant's hoard has way more treasure than whatever the goblins are hauling around. WFRP is about Rat Massacre. "Yes-yes. Puny manthing understands WFRP." As for giant slaying games in D&D. Ambushes and dirty tricks are your friends. Only a fool fights a superior foe on even terms. Look at the better class of S&S source material (Conan, Kane, etc. Not Charles Saunder's "Imaro" books, the hero there just has mile-thick plot armour and powers of grunting and flexing that make Flex Mentallo envious); the hero is /always/ using dirty tricks against stronger foes. Of course, this kind of tactical planning is hard (and often impossible if you have a poor DM who tries to block player plans that diverge from his intended solution), so most casual games default to a "collect n+1 [yard trash monster] [body part]" model. Giant-slaying is one of the most singularly fun things there is to do, but frankly there's a lot to be said for wading through a couple dozen mooks like it's no big thing. I think 4e does a good job of mixing the mediums, which may account for it being my preference. I think it also has something to do with the fact that one influence on my view of good fantasy is Marvel's old Savage Sword Of Conan title. Ha! Rat Massacre indeed. Yes, a fair point. I miss WFRP. If you're running adventures with decent stories it's likely that the balance of goblin slaying vs. giant slaying doesn't matter, because the opponents the players encounter are inherent to the story and match their expectations. A good mystery, for example, might only lead to repeated goblin slayings but can be fun regardless. But I do think systems where combat is deadly discourage these kinds of mass combats. D&D has many good points, but the sudden-death nature of its combat system ain't one of them. opossum101: A giant's hoard will pretty much always be worth more XP than a group of goblins', so I think Zak was just implying that if the DM insinuates as much to the players they're naturally going to be more interested in the giant hoard. At least, if they're worth their salt. Oh possum, I love any man capable of using that phrase. Great post - this really has me thinking about what sort of creatures to introduce the player characters to. I watched Outlander recently and that inspired me to put something... bad... out in the wilderness of the campaign world. I'd thought the players wouldn't encounter it until they'd gone up in level a bit. In Ultima Online and other crpgs I would go giant slaying for fun & challenge, but I called it "Big Game Hunting." Big Game generally has not just more but also better treasure!